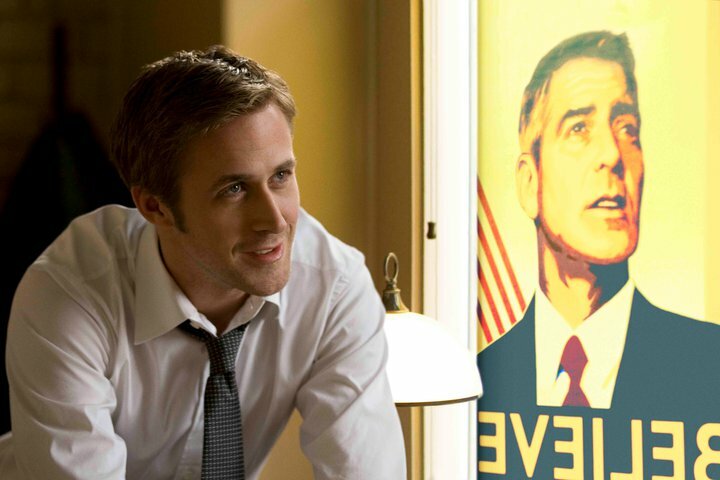 The fallible protagonist of The Ides of March is Stephen Myers (Ryan Gosling), an eager and optimistic seed in the Democratic Party. Stephen is currently making a splash as the assistant campaign manager for Matt Morris (Clooney), the suave Governor from Pennsylvania fighting to become the new leader of the Democrats and, in turn, the next President of the United States. Morris seems an ideal candidate to take America forward: he is an agnostic and will therefore treat equally Americans of all races and religion; he also advocates ending the war on terror by radically altering America’s reliance on oil, and he plans to create thousands of new jobs in the process. He is also a smooth orator and incredibly charismatic. He also sports a Shepard Fairey style campaign ad, if the Obama resemblance was not enough. Much like Obama’s appeal back in 2008, Morris’s forward-looking idealism makes Stephen such a devoted member of his campaign. Even when Tom Duffy (Paul Giamatti), the leader of the campaign for Morris’s opponent, approaches Stephen with news that backroom deals are in motion to ensure that Morris will lose the Ohio primary, Stephen rejects Duffy’s proposal that he come work for them. “I don’t have to play dirty anymore – I got Morris,” Stephen says when Duffy offers him an assured ticket to the White House. Stephen, however, keeps his meeting with Duffy a secret even while he, Morris, and Morris’s campaign manager, Paul (Philip Seymour Hoffman), strategize how to win over Ohio’s Senator Thompson (Jeffrey Wright). As Paul’s previous meeting with Thompson reveals, the Senator is willing to pledge his delegates to whichever candidate offers him the sweetest Cabinet post. Like Stephen, Morris refuses to make backroom deals and he rejects Paul’s advice, believing that integrity and commitment can lead a politician to victory. 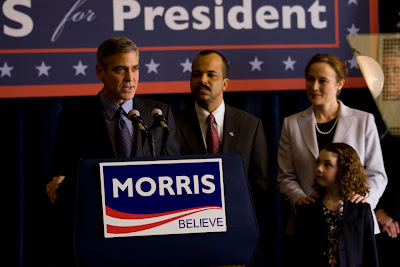 As Morris gradually loses his lead in the campaign, though, integrity and loyalty fade as the driving forces behind the key players in Ides of March. The characters acknowledge that they are playing the same game, albeit with different rules; however, as we all learned while playing Monopoly in our youth, well intentioned fair play amounts to nothing if the opponent playing the banker is lifting twenties on the sly. Like a dirty game of Monopoly (or, worse, Settlers of Catan), what ensues is a series of double-crossings and dirty deals from which none of the players emerge unscathed. On the other hand, perhaps they do. The most unsettling aspect of The Ides of March is how Paul, Tom, Morris, and eventually Stephen accept the kill-or-be-killed mentality of the campaign game. Especially when Molly (Evan Rachel Wood), a plucky intern and the object of Stephen’s only personal relationship, becomes an unwitting pawn in their game, Ides of March offers a truly bleak portrait of the democratic process. Stephen’s inevitable corruption makes the whole procedure seem redundant – and philosophically vacant – but that also seems to be how Paul and Tom function, and their jaded quest for victory confirms that nice guys do indeed finish last. However dire Ides of March may seem, Clooney charts an impeccable rise and fall for the characters, making the film enormously engaging and tremendously watchable. 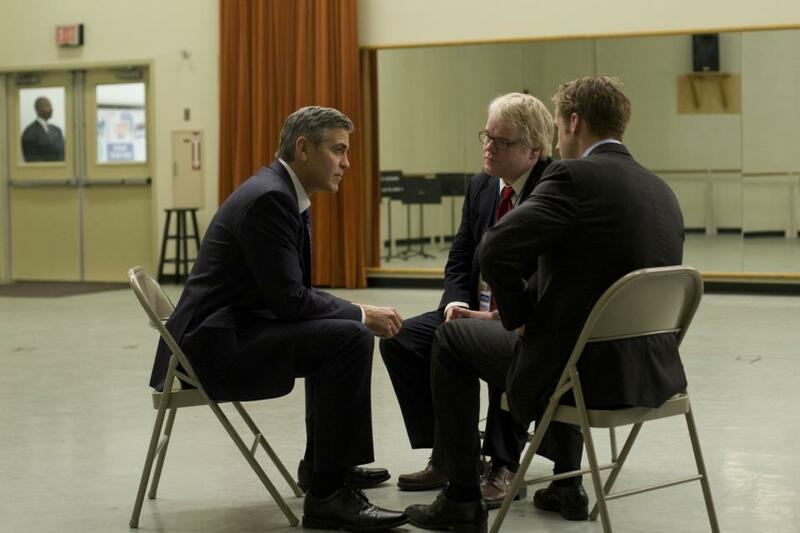 Ides is Clooney’s fourth effort as a director, and while it might not share the five-star pedigree of Good Night, and Good Luck, Ides of March once again displays Clooney’s strength behind the camera, as his film is excellent in its execution of entertainment value and timely political commentary. While Morris's affiliation with the Democrats injects some of Clooney's own political leanings into the film, it also grants a dark sense of foreboding to the film: if even the Democrats are willing to fight dirty, what hope is there for America with its two party system? While Clooney excels behind the camera, he also performs well in front, offering a fine supporting turn as the chameleon-like Morris. In fact, The Ides of March could very well do for the Best Support Actor category what The Help does with actresses, as Clooney directs an ensemble where every actor is impeccable, from the lead performer to the bit players. 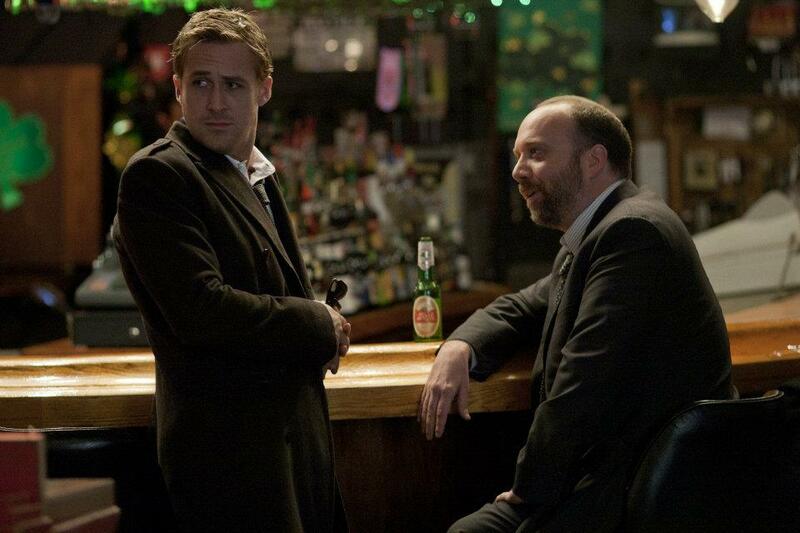 Ryan Gosling once again displays his tremendous versatility after Drive and Crazy, Stupid, Love. As Stephen, Gosling guides the viewer through a gradual reversal of fortune: as Stephen goes from shining to falling star, and fights violently to stay atop, the about-face in Gosling’s character is compelling, and painfully so since Gosling leaves some subtle pangs of regret on Stephen’s otherwise resigned demeanour. As Stephen’s mentor/nemesis Paul, Philip Seymour Hoffman gets the film’s most explosive role and inhabits it with such gusto that one fears the actor might burst a vein. Paul is a showy role with which a lesser actor could do fatal damage to the film, but Hoffman’s well-articulated verbosity almost leaves the audience cheering against Stephen. Likewise, Paul Giamatti offers an amiable foe in Tom Duffy, so he and Hoffman provide worthy adversaries as the two spin-doctors. Not to go unmentioned, either, is the terrific work by Evan Rachel Wood, who has the difficult task of playing the only role of any discernable emotional vulnerability. As with Hoffman’s role, Molly could have offered a feast of overacting, but Wood gives a carefully restrained performance and delivers a character worthy of the pivot on which the film rests. Finally, Marisa Tomei makes the most of the film’s only under-written character and her praiseworthy zest as a dogged reporter for The Times extends the memory of her character beyond her sparse screen-time. The same goes Jeffrey Wright and Jennifer Ehle in what are essentially extended cameos. The powerhouse ensemble ensures that none of the foes in The Ides of March are outmatched when the time comes for characters to collide head-to-head. Each of the players in this well-written tale is worthy of consideration, for as one watches with anguish as ideal candidates fall from grace and scrap in the mud, one can’t help but despair at the thought that the world’s most powerful country is ruled by players as corrupt as these. Clooney handles it brilliantly though, and he’s aided by top-level work from composer Alexandre Desplat, cinematographer Phedon Papamichael, and editor Stephen Mirrone. Not to be missed, The Ides of March is a stylish, unsullied dirge for an empire that was once as strong as Caesar’s. The Ides of March is currently playing in wide release.